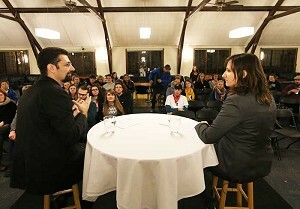 Josh Brahm and Deanna Unyk dialogue at University of Portland. They suggest good listening in the abortion debate as a path to truth. Josh Brahm is a straight, Christian, pro-life campaigner from California. Deanna Unyk is a gay atheist college student from Canada who was a pro-choice blogger. They have become best friends. It happened over the course of 127 lengthy emails and more than 20 hours on Skype. Unyk became pro-life in May and the two have continued their surprising alliance. They had not met face-to-face until a Nov. 17 talk at the University of Portland. Voice for Life, the pro-life club at UP, received grants to bring the two on campus for a dialogue. Here is their message: truly listening to people with other opinions is not a betrayal, but a path to truth. Almost two years ago, Unyk emailed Brahm and asked him a long list of questions and made her pro-choice case in a long essay: women ought not be forced to be “life support machines” for unborn babies. Unyk says she never took the time to really examine her views. Brahm was similar. “I once had a very jerky attitude about pro-choice people,” he says. But during a long Facebook debate over abortion with several dozen people, Brahm found himself liking some of the pro-choicers, even if he hated their positions. He decided to listen. He has found the new stance more fruitful. The more he listens to others, the more they listen to him. Unyk began watching Brahm’s YouTube channel. Here was a pro-lifer who understood the pro-choice side, without backing down on his own convictions. She sent her email. They exchanged ideas in the digital realm for more than a year and a friendship grew. When Unyk’s grandmother died, Brahm comforted her. “Besides the fact that Deanna was pro-choice and lesbian and in Canada, we were practically twins,” says Brahm, a married father of three who believes marriage is a union of one man and one woman. Unyk changed her views, but not because Brahm pounded them at her. It was the gentle, compassionate logic of the pro-life view that eventually made sense. She realized there is a big difference between letting someone die and actively killing a human being. This woman who long argued for bodily rights began to see that dismembering an unborn child is obviously the most serious of bodily violations. Unyk thought of her sister, who has Down syndrome, and realized that many babies with the genetic disorder are aborted. Brahm gets criticized by many pro-lifers who find him soft on the cause. He points to Unyk as the fruit of his approach. Unyk says it became impossible to think of Brahm as evil or ignorant. Unyk and Brahm have tips for pro-lifers who want to be more effective: don’t call anyone names, be open minded, listen genuinely, share personal information, be patient and reflect on what your interlocutor says.